After yesterday's great birding, Jeremy G and I decided to spend the morning checking out a couple of usually underbirded locations. Seems the last few years a number of amazing birds have shown up in places birders rarely go anymore, so we figured we would try our luck. G wasn't deterred by this being his first real day back on the continent after putting the birders of Hawaii on notice, and we met at Macaulay Point at 7am. I made it a priority to grab a coffee on the way, apparently he hadn't..... nevertheless, we were both keyed up and ready to hit it out of the park. Macaulay Point is an area that I have only birded twice previously but it has a lot of potential, and birds started showing immediately. In the marina area inshore was a Red-throated Loon, a Common Murre, and a small number of mixed ducks. There seems to be a lot of Red-throated Loons around this year, with many close in to shore or in sheltered areas.... a far cry from many years when a single offshore is reason for celebration. We set up our scopes to scan offshore, with Common Murres, Rhinoceros Auklets, and Double-crested Cormorants very evident. It wasn`t long before G called out that he had two phalaropes. Being November, we both figured on which species they would be, and good observation revealed them to be Red Phalaropes, the first really good bird of the day. The rest of the area yielded a good number of species including Northern Harrier, Bald Eagles, Harlequin Ducks, 15 Bonaparte`s Gulls, a single Thayer`s Gull, and an American Pipit overhead. Near the end of our walk we heard a Varied Thrush leading off a chorus of ticked off songbirds, and the level of aggravation had us thinking owl in a second. The habitat led me to think maybe a Long-eared was hiding somewhere, but we couldn`t dig anything out. After a quick breakfast and coffee stop at the James Bay Starbucks we headed to Beacon Hill Park and Goodacre Lake, where G was hoping to catch up with the Blackburnian Warbler, last seen 6 days ago. While I was parking G started birding, and texted me immediately with his second great find of the day. 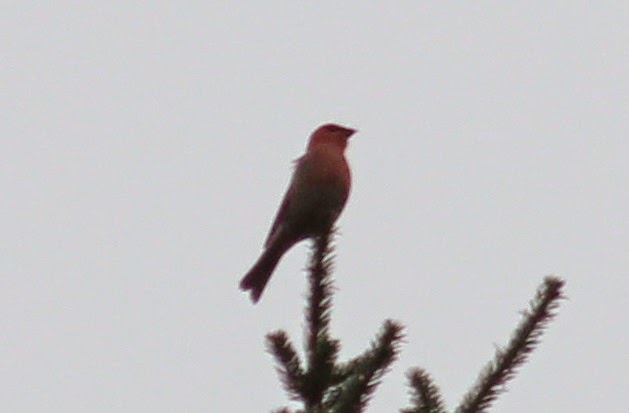 This male Pine Grosbeak was showing very well and being very vocal near the bandstand. Interestingly, Jeremy had commented a couple of hours earlier how this was going to be the year for low elevation Pines. After a few minutes of enjoying this bird from every angle it flew off and we lost sight of it in the direction of St Ann`s Academy. While we never did relocate the Blackburnian, there were enough birds to keep us busy for two and a half hours. Among the remaining highlights was an intergrade Northern Flicker, which was being constantly harassed by a pure Red-shafted male. Our first view of the two birds was the Red-shafted powerslamming the intergrade (which at first appeared to be a pure Yellow-shafted) from a branch 8 feet up, and we could clearly hear the thunk as the intergrade was driven into the ground. We watched their antics for 15 minutes, but try as I might the light was against me in the picture department. Carrying on we found good numbers of Bushtits, Golden and Ruby-crowned Kinglets, and Chestnut-backed Chickadees. We walked the trail behind the maintenance yard, near where the Blue-Grey Gnatcatcher was a few years back, but only succeeded in turning up two pissed off Anna`s Hummingbirds and a Pacific Wren. We were almost done the loop when The Naturalest Naturalist scored his hat trick with another good bird. It is always a treat to see owls, and this roosting Barred Owl was no exception. It was extremely cooperative, and I managed a few pictures. Nothing else turned up, though G did stick around a little longer than I did. I managed a Merlin on the way home, but that is about it. Until the next time, Good Birding!